Quick charge – does the power bank output 1A, 1.3A, 2A or more? Warranty – is the manufacture of the product confident enough to offer a sufficient, extended warranty? The RAVPower 26800mAh portable power bank certainly ticks many of these boxes, and this review post will outline them below. It’s important to be clear that the RAVPower 26800mAh portable power bank isn’t for everyone. It’s a heavier-duty, much larger USB power bank aimed at users who are serious about powering their devices on the move. Most power banks you see in high street stores rarely peak over the 10000mAh mark. That makes the RAVPower 26800mAh portable power bank 2.5x bigger than a standard power bank, and so you should expect the retail price to reflect this. The title makes it very obvious that the RAVPower 26800mAh portable power bank is dominant in this category. The iPhone 8 Plus has a 2675mAh battery which means this power bank can charge the iPhone from zero to full ten times over. Given that a smart phone battery typically lasts for a day, this power bank is able to recharge your device for an entire week before the power bank will need to be connected to the mains! But be aware, things like the quality of the battery cells, trickle charging, poor quality charging cables and capacity leakage will have an effect on the numbers shown above. The manufacturer has not published how long the RAVPower 26800mAh portable power bank takes to be recharged, but from my testing I found that it charged from zero to full in around 10 hours. Given the capacity of this device, you should not charge it from a Laptop/PC USB port. Instead plug it in to the mains with at least a 2A adapter. A mains adapter is not included in the box. Weighing in at just under 500 grams, whether or not the RAVPower 26800mAh portable power bank is considered portable to you would largely depend on your usage. If you were to carry it around in your pocket all day you may find it too big and heavy compared to the super-small 2000mAh battery packs on the market today. But given the RAVPower on show here has more than 10x the capacity, it doesn’ take up 10x the space. Though it is bigger than the average power bank on the market today, it is not distinctly bigger than a larger-capacity power bank, especially if used on travels and kept in a backpack. 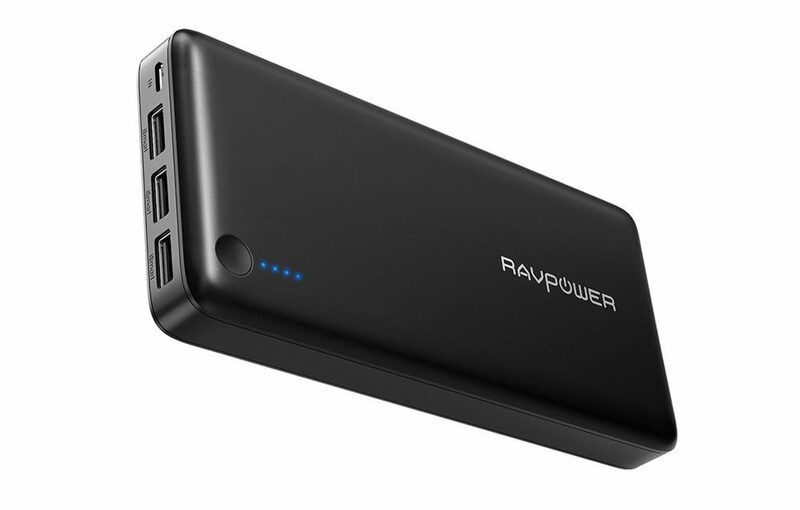 The RAVPower 26800mAh portable power bank has three output ports (all USB) which can deliver a total output of 5.5A. Coupled with RAVPower’s iSmart technology which optimises the output to charge your devices as quickly and as safely as possible this means you can quick charge with an output of 3.4A. For many smartphones and tablets, this high output halves the charging time required. At £34.99 it is a real investment. For the quality of the power bank, the bundled iSmart technology, three outlet ports and high-capacity this is a good deal. But, you need to be sure it is not overkill for your needs. RAVPower have great confidence in their products, and any review sample I have ever tried has easily lasted a few years of usage. Unlike many other manufacturers in this space, RAVPower are offering an eighteen months extended warranty where they will replace your product with no questions asked if it develops a fault under general use. But, a good warranty offer is only worth its value if the customer service matches up to the same standard. From my experience, RAVPower are prompt to respond to issues and queries submitted by email, and the support staff are genuinely well-trained, courteous and nice people.